I simply love a well made cocktail in an exclusive setting. Apothéke is one of NYC's hidden (at least to the people waking by) cocktail bars. You can easily walk pass this place and you will never know. 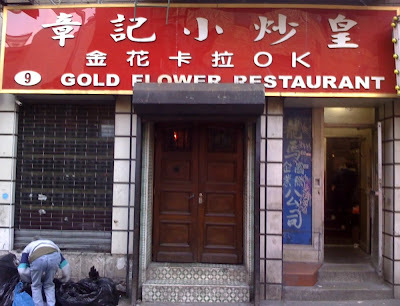 Outside, sign from the previous business still stands as the Gold Flower Restaurant. Window next to the door is covered by the old fashion bottles as a semi-private screen. Once you walk in you find yourself in a combination of an old fashion pharmacy / opium den / haunted house living room but still an oasis in the middle this Chinatown back alley. We got there ten minutes after 6 PM on Saturday. They were still getting ready but they were nice enough to let us take a seat and browse the cocktail menu. The place is a large L shaped room with tin ceiling tiles, brick and upholstered walls. It looks like it gets packed at night so you need to get there early if you want to grab one of the sofas. There isn't much privacy like the other speakeasies offer such as Milk & Honey, Raines Law Room or PDT. Soundtrack was kind of new age / instrumental from Pandora.com but I believe they have DJ plays later in the evening. At that time there was another couple seating at one of the eight antique looking sofas with small tables. It was pretty bright when we walked in but then the lights dimmed to an almost complete darkness. Nice thing was they have whole bunch of candles and small light fixtures that give an opium / absinthe den feel to the place. Menu is divided in to sections like: Health & Beauty, Stress Relievers, Pain Killers, Aphrodisiacs, Stimulants, Pharmaceuticals, Euphoric Enhancers and Therapeutic Treatments. 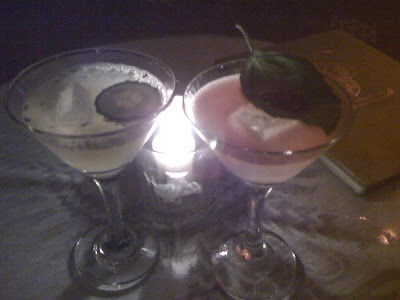 We selected the: Deal Closer [ vodka infused with local Chinatown aphrodisiacs, fresh mint, cucumber, lime and vanilla essence] and the Spicy Tomato Basil [house gin infused with a cherry tomatoes, fresh basil, pepper corn, Habanero bitters, fennel-Himalayan salt rim]. Drinks were both well crafted and nicely presented. 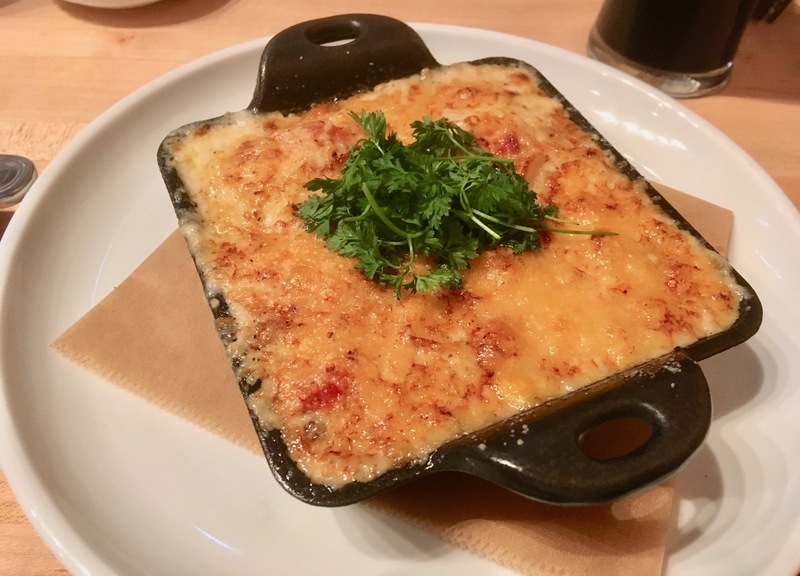 We could have easily ordered second or even third rounds but this was only the re-con mission before our dinner reservation so we had to pay [came out to $35- with a generous tip for two cocktails] and get to our dinner. Bartenders were wearing short lab coats behind the bar full of antique bottle filled with various ingredients such as beans, cherry tomatoes, orange peels, etc. in liquids. 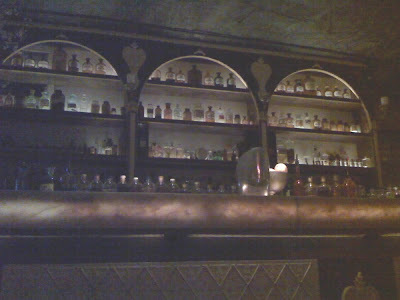 Also wall behind the bar is full of antique bottles with various labels to give the place an 18th century pharmacy feel.